Four luminous complementary shades blends together perfectly to enhance any skin tone with the perfect amount of illumination. The longlasting, light and color rich, powder formula adheres comfortably to the skin. Each shade blends evenly for the illusion of natural, sun-kissed radiance. Apply sheer hues across the face to add warmth and a subtle glow, or build color within the apples of the cheeks for a luminous flush. Apply to clean skin with the Cheek Colour Brush to concentrate placement on the apples of the cheek. 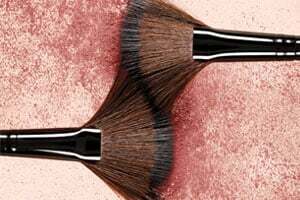 Swirl the Bronzer Brush over the Illuminating Powder and sweep across the face for healthy radiance. Focus on adding color to the high portions of the face where the sun would naturally kiss the skin. Select shades can be used across the face to add definition to eyes and enhance the décolleté. A sweep of color across the shoulders and collarbone adds warmth and a natural sunkissed glow. (Coral Red, Pink Rose): Talc, Mica, Zea Mays (Corn) Starch, Dimethicone, Octyldodecyl Stearoyl Stearate, Zinc Stearate, Pentaerythrityl Tetraisostearate, Zeolite, Sorbic Acid, Methylparaben, Propylparaben, Tetrasodium EDTA, Butylparaben, BHT. (+/-): CI 77891 (Titanium Dioxide), CI 77491 (Iron Oxides), CI 77492 (Iron Oxides), CI 77499 (Iron Oxides), CI 15850 (Red 7 Lake), CI 73360 (Red 30 Lake), CI 19140 (Yellow 5 Lake). (Mocha Spice Quad): Talc, Mica, Zea Mays (Corn) Starch, Dimethicone, Octyldodecyl Stearoyl Stearate, Zinc Stearate, Pentaerythrityl Tetraisostearate, Zeolite, Sorbic Acid, Methylparaben, Propylparaben, Tetrasodium EDTA, Butylparaben, BHT, Zea Mays (Corn) Oil, Ginko Biloba Leaf Extract, Rosa Canina Fruit Extract. (+/-): CI 77891 (Titanium Dioxide), CI 77491 (Iron Oxides), CI 77492 (Iron Oxides), CI 77499 (Iron Oxides), CI 15850 IRed 7 Lake), CI 77007 (Ultramarines).